I have been playing Warhammer and collecting miniatures for close to two decades now. I got into the hobby somewhere around 1995 and have been in and out of it since then. I currently play three Warhammer Fantasy armies, and Skaven are my latest and ironically the most complete one. I have started it when me and my brother went halfsies on the Island of Blood box set. He took the High Elf minis, and I took the Skaven. Initially I figured I will just put them together and use them as a small 500-1,000 point force for pick-up games. The goal was to make it playable without spending any money. Of course, as it always happens with Warhammer money got spent and I ended up with a 2,000 points. The good news is that this army is more or less complete. Unlike my ever-expanding Dwarf Throng, I don’t actually see it ever growing beyond this size. It’s compact, flavorful and diverse enough to handle most situations. It has all the unit types I like, and none of the stuff I don’t. I’ve been told it is a pretty fun list, so I figured I would share it here along with some pictures. Please note that I am not what you would call a “competitive player”. When I design an army I usually pick units that fit a theme I like, and which seem characterful and appropriate for the army, rather than the stuff that will guarantee me a win due to a rule loophole. I tend to play with like minded people and we usually have a lot of fun with troop heavy, low powered pitched battles without any meta-gaming or dirty tricks. The Skaven Clan Skryre is known for their Warlock Engineers which are essentially mad scientists who are also wizards. Skaven have a surprisingly advanced steam-punk style technology which is mostly powered by magic. Their main energy source is Warpstone which is magically “radioactive” substance – a crystallized magic that warps and mutates everything it touches. The instability of magic, and Skaven shoddy workmanship makes their technology highly unstable. Their war machines tend to kill as many allies as they kill enemies. But it works out in the end because Skaven life is cheep and plentiful. Clan Skryre is known for unreliable, unstable, explody technology. My army is a Clan Skryre Field Research Team whose primary task is to “peer review” the technological achievements of other races or factions. The review is of course done whether without the subjects consent and frequently over their dead bodies. To achieve this task, the Field Unit has been equipped with a lot of advanced Clan Skryre weapons. The secondary mission is to field test these weapons, figure out how they behave in extreme condition, note how often they explode, and how many friendly deaths they cause on a monthly basis. Let’s start with the core, which is the heart of every army. In case you’re interested, 48% of the total cost (points wise, not dollar wise) is spent on core troops. The unit consists of 36 Clanrats armed with spears and shields accompanied by a Poisoned Wind Mortar. 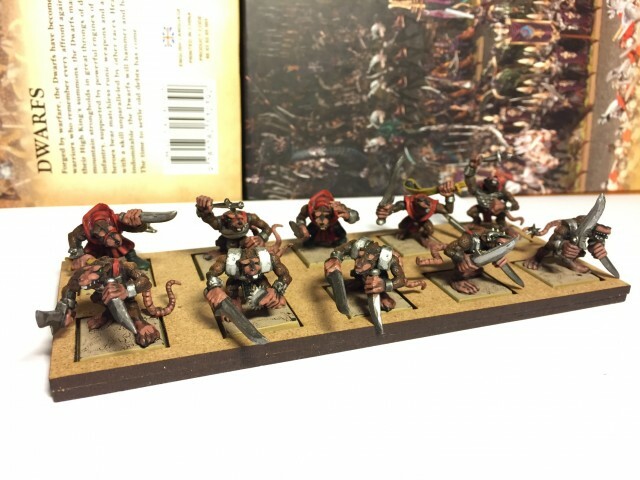 The models are the plastic Clanrats from the Island of Blood set. I specifically picked the models that had a lot of armor to represent their status and fighting capability. I painted them red and yellow which are the twp primary colors I picked for my army. This is partly because they are considered Skryre appropriate, and partly because I like how they look. I knew I would be painting a lot of brown, gray and black fur so I wanted their clothes to be distinct, and also to stand out on the table. 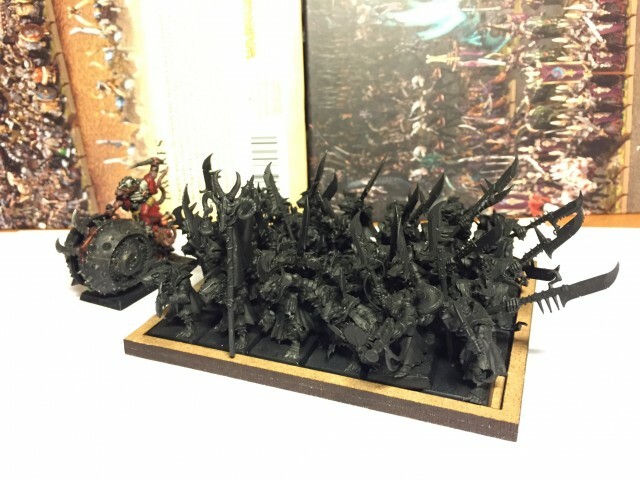 In most cases, this is the actual core of my army and this unit is typically joined by the Warchief making it quite capable in combat. They are also known as Skavenslaves but I don’t like to call them that. The unit is 60 model strong and contains a musician and a Paw Leader. It looks really, really intimidating when I put it on the table. The models are also from the Island of Blood set, but hand picked for minimum armor. They all are equipped with spears and shields because I like to have an option to add these if I need them. In most cases I field them “naked” with just hand weapons to shave of few points. I pained their coats yellowish brown color to set them apart from the Clanrats. Their weapons and armor are old and rusted to indicate that unlike the paid researchers they get worst equipment available. The rust effects were done using Typhus Corrosion technical paint. The open secret here is that this is actually the weakest unit in my army. These guys cost less, and perform worse than giant rats. But due to the unit size, the way Skaven add their rank bonus to their leadership and the “horde” rule they actually become somewhat formidable in combat. Opponents often get scared of this unit and try to thin it out from afar via shooting, which is great for me because it means they’re not shooting at units that actually count. The inters can soak up an incredible amount of damage without actually impacting their fighting ability (which is basically close to zero). 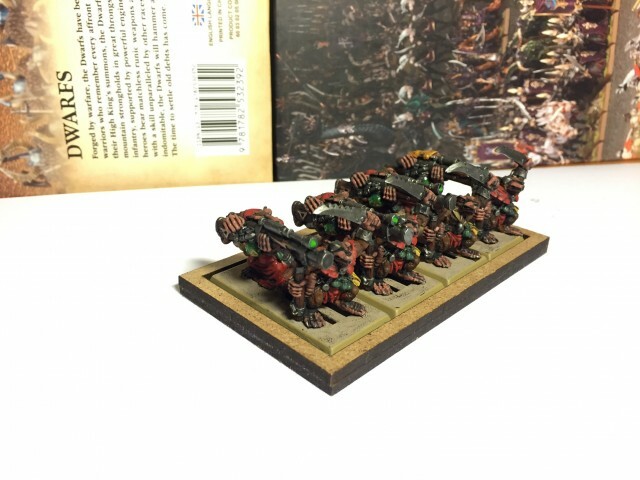 A unit of 30 Stormvermin with full command group. They are usually lead by Warlock Engineer Babag who typically carries Warp Musket, a Doom Rocket and sometimes some magic spells. They also have an attached Doom Flyer weapon team. 30 Storm Vermin with Warlock Engineer. The models are basic 8th edition Stormvermin plastics. They are armed with halberds and shields. The Doom Flayer attachment is a mini-chariot type thing which has impact hits and extra attacks. These are my heavy hitters and they are typically joined by a Chieftain with a Battle Standard for an extra “oomph”. This unit is currently a work in progress. As you can see, I primed them but did not have a chance to paint them yet. Stormvermin look imposing but not overwhelmingly so. They are only marginally scarier than the Clanrats and this is partly by design. I don’t like to put all my eggs in one basket, and by presenting the enemy with two heavy hitting core combat units I force them to make hard decision. Ignoring either is perilous, and splitting fire between the two is ill advised because both units can soak up a lot of causalities due to their large size. 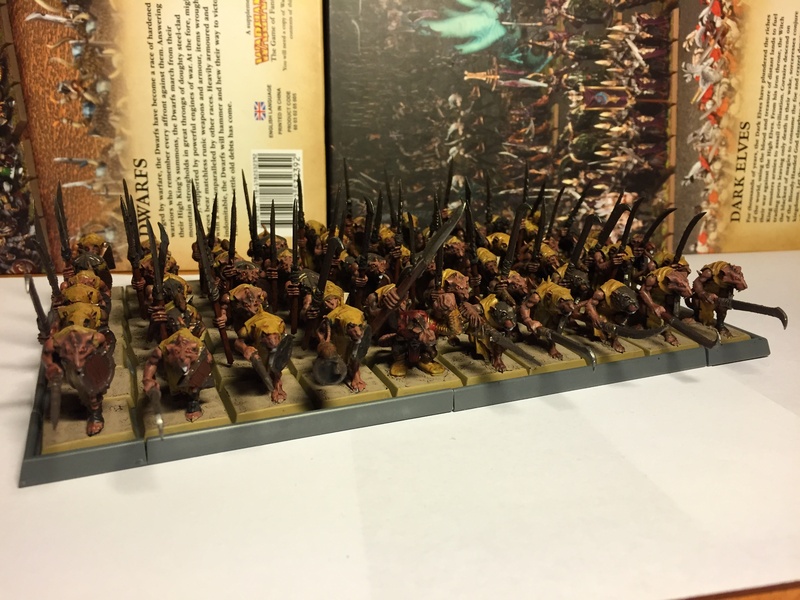 A unit of 20 Giant Rats accompanied by 5 Packmasters on loan from Clan Moulder. 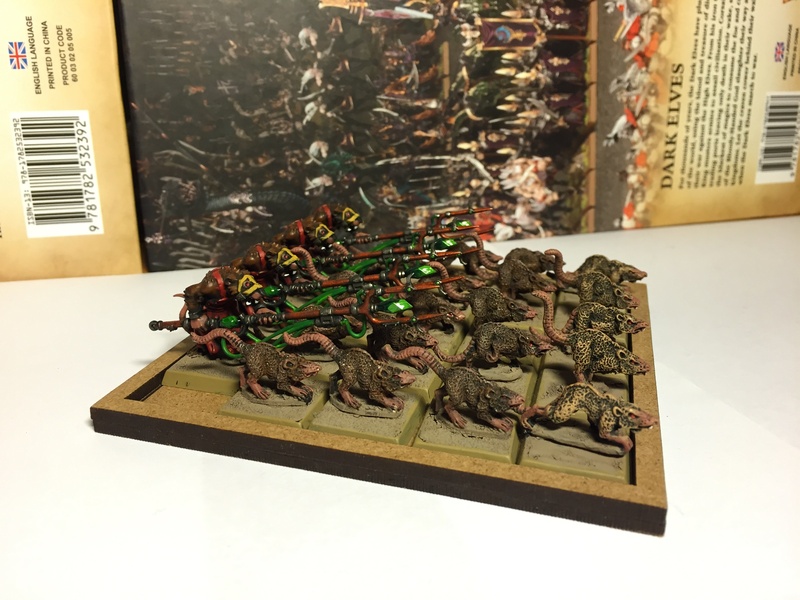 The rats have been purchased on a Clan Moulder grant to research “better things to poke the rats with” technology. The Packmasters are plastics from the Island of Blood set. You can actually buy them individually on eBay for almost nothing. The Giant Rats are actually vintage Marauder miniatures from the 80’s. The first rank with a lighter coat was actually painted by my brother ages ago when he was using them for Mordheim and I didn’t feel like re-painting them. I didn’t feel like repainting them so I just tried to match the color the best I could, though my rats are markedly darker. One of these days I will add some highlights that match the front rank. Four Rat Swarms on standard swarm bases. These are the smaller, inferior rats that are rejected from the grant program. The interns keep feeding them so they just follow the research teams wherever they go. 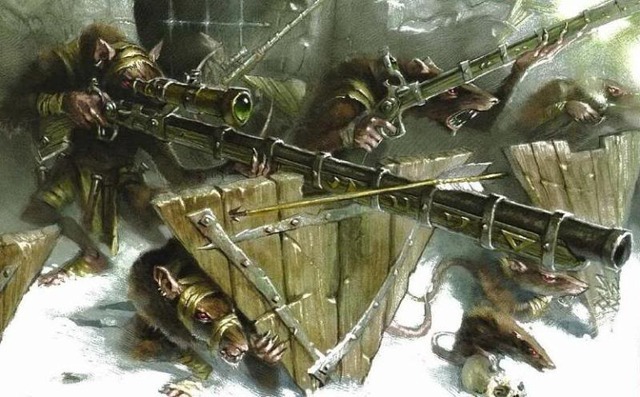 Most of them think they are pets, though some actually think they are real Skaven and they even took to wearing tiny clothes and wielding tiny swords. This probably has nothing to do with the leak in the portable warpstone reactor under which they made their nest. Some of these came in the Doomwheel set. I bought the rest on eBay in a bag. Someone was literally selling a bag of plastic rats for like a buck so I picked it up. They don’t look like much but they are unbreakable and can actually tie up the enemy units for a turn or two setting up some beautiful flank charges. A group of 10 Night Runners armed with slings. Their task is gathering requirements for new projects, and also scouting ahead of the army. They exist to annoy the enemy and take the heat of the core of the army. Their slings can do surprising amount of damage to lightly armored units, and they can easily block march moves or charges if they need to. 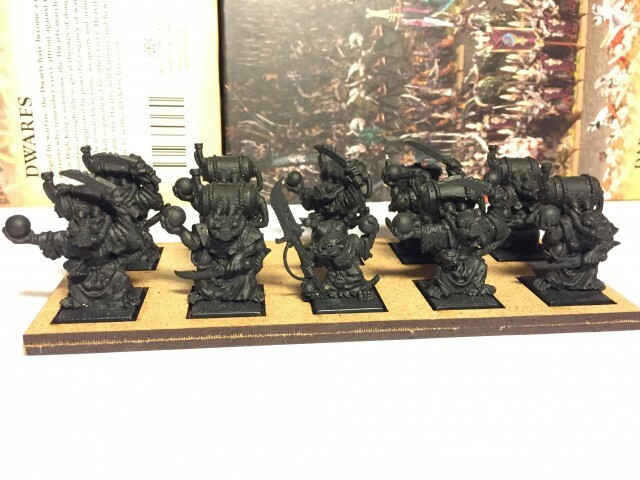 The models are old Gutter Runner plastics. My brother bought a box of them to use for Mordheim at one point and I inherited them later. He also managed to lose all the extra weapons that were in the set, which is why they have a mix and match type equipment. About 26% of my total point cost of the army is allocated into the special category. In most armies this is where all the cool stuff is, but with Skaven I did not actually feel the urge to max out this category. Four Warplock Jezzail weapon teams. Their area of research is optics, and more specifically the “glass tubes what you put on guns so that you can shoot things far away”. The models are vintage Marouder models that date back to (I believe) 4th edition. Back then the Jezzail teams had the pavis shields which is why they are not represented on these models. Originally I have treated these models like a cheep version of the Dark Elf Reaper Bolt Trhower, but cheaper, stronger and less accurate. At short ranges this small unit is very deadly – especially to heavy cavalry. At long ranges however, their poor accuracy makes them rather ineffective. I’m currently working on obtaining models to double the size of the unit. Eight Jezzails should be a very formidable firing squad. The field equipment maintenance team consists of four Rat Ogre janitors and two Clan Moulder Packmasters. They were brought on board in order to handle heavy equipment and carry heavy boxes, but they are also pretty formidable in combat. 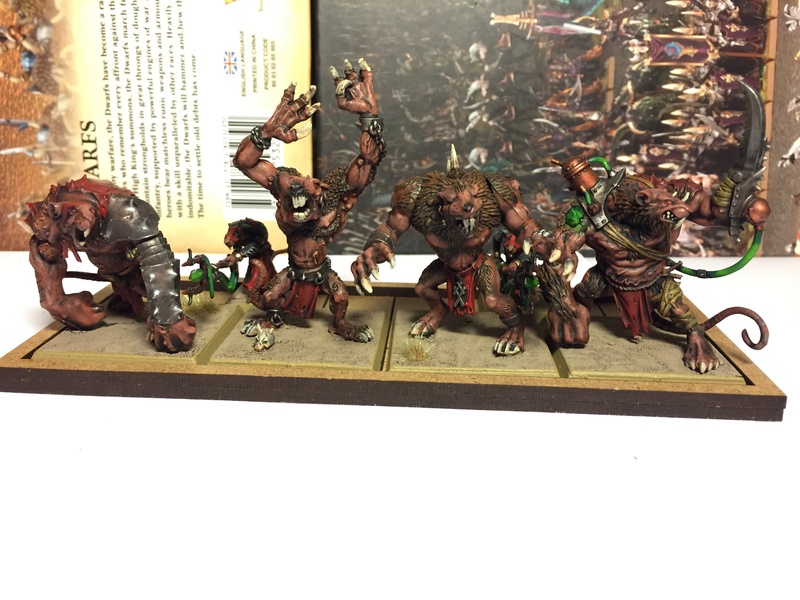 Two of the Rat Ogre models (extreme left and right actually) are from the Island of Blood set, and so are the Packmasters. The second model from the left is an old metal Marauder cast from the 80’s, while the remaining one is from the last edition plastic set. I actually really like the miss-matched look this gives to the unit. I used my standard red and yellow color scheme on all the models. The Rat Ogres skin is painted with Bugman’s Glow and the scars and stitches are highlighted with Ratskin Flesh. I painted the Packmaster fur black to indicate their high status. I imagine the Clan Moulder only picks the largest and strongest Stormvermin for handling of large beasts such as Rat Ogres. They are very intimidating on the field, that said they are a bit of glass cannons. They might look tough, but concentrated missile fire will cut them down real fast so they need to be deployed and moved carefully. As you can see, the unit is still a work in progress. The models are all current edition metal miniatures, with exception of the Warlock Engineer who was converted. The base model is a vintage Marauder death-globe warlock. I clipped his shoddy looking spear and replaced it with the high-tech looking Warlock weapon from the Island of Blood warlock. I also added the power-pack on his back from the same set. This unit is rather versatile. Because their weapons ignore toughness they are excellent monster killers. I have also successfully used them to take down Imperial Steam Tank by simply drowning it in poison gas. The Warlock will sometimes have spells, but if I’m feeling especially nasty both him and the unit champion will be carrying a Death Globes. Rare units compose 12% of my army. One Doomwheel used as a portable generator that also doubles as an excellent war machine. The model is 8th edition plastic set, which in my opinion is the best looking incarnation of this model yet. 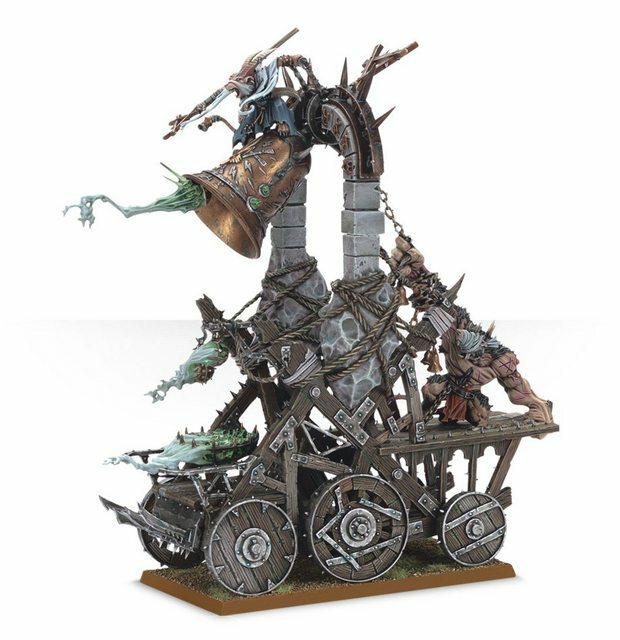 I have always loved the Doomwheel because it is basically the signature Skaven war machine, and the finest Clan Skryre invention. It is basically a giant hamster wheel used as a chariot. 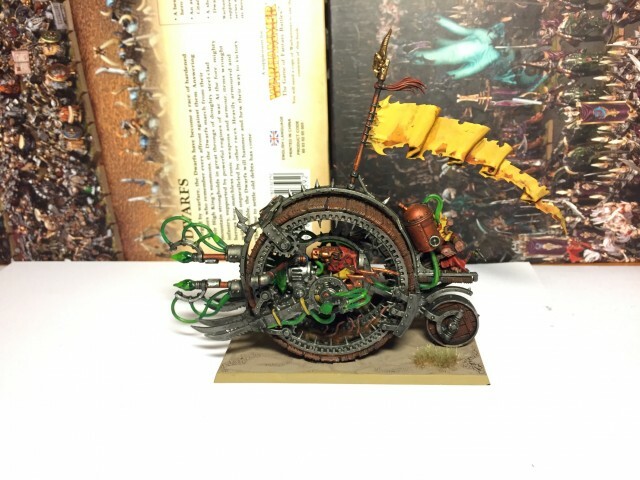 It has random movement, can easily spin out of control and it blasts warp lightnings at the nearest target (so usually a friendly unit) making it fun and hilarious addition to the army. Doomwheel related failures are always spectacular. One Warp Lightning Cannon used as backup generator / heavy artillery. As of writing of this post, I don’t actually have it put together yet, so no picture. Similarly to the Doomwheel, I think the current edition plastic set is superior to previous incarnations, partly because of how intricate it is. This machine provides much needed long range support for my army. Heroic characters compose 15% of my army. You will probably note that all of my heroes are named after TV science personalities. Billnye is a Warlord on foot. The model is the Warlord from the Island of Blood set. 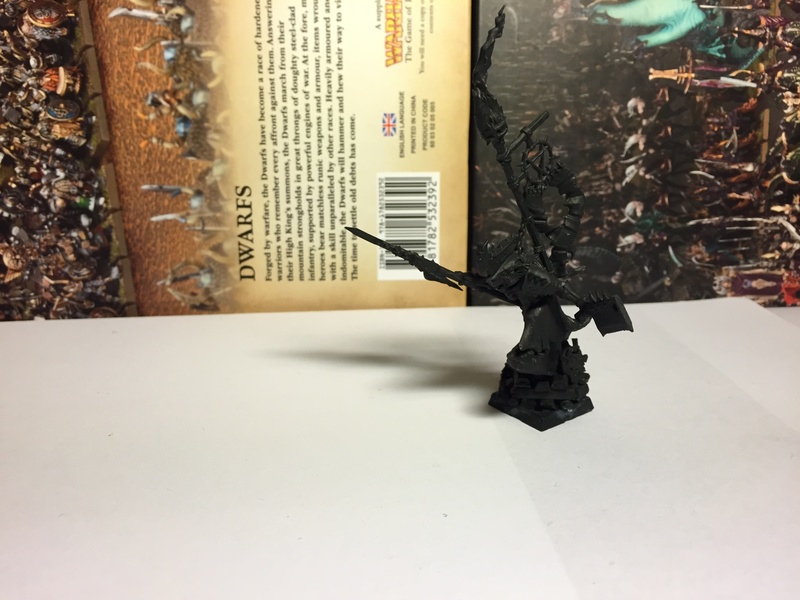 I had to elevate him a bit by building up a pile of rubble on his base in order to make him fit neatly in the unit (his outstretched arms made it difficult to put him in a formation) so now he towers over his underlings. It is a really nice model, and it doesn’t really need much conversion work. I typically field him on foot, with a halberd, tail weapon, poisoned attacks and sometimes a rat hound. I’m also considering building him a War Litter out of spare Skaven models. Billnye usually hangs out in the Clanrat unit, and his sheer presence there is what makes people agonize as to whether shoot at him or the Stormvermin. He is pretty deadly in close combat against rank and file units, tough he usually struggles if challenged by tough heroes of other races. 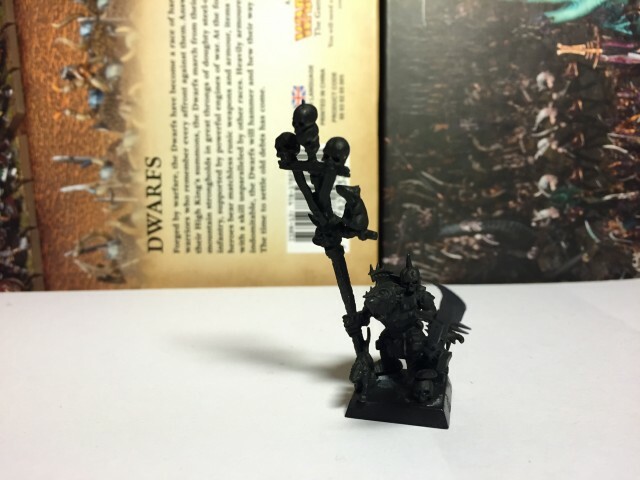 A Chieftain upgraded to a Battle Standard Bearer with the Banner of the Underhive. This is actually my most complex conversion in this army. I used a crouching body from a Night Runner set, and repositioned it so that it looks like he is resting his foot on a skull of a fallen enemy. The right hand is a banner staff from an old Mordheim set. The cross-bar with a rat perched on it and the tiny bell are from the Island of Blood Clanrat banners. The left hand and the shield on the back are spare parts from current edition Stormvermin box. The head was carefully clipped off a Clanrat unit champion from the Island of Blood set. He is nowhere near as intimidating as Billnye, but then again he is not supposed to be. The Banner of the Underhive provides additional attacks to the already quite capable Stormvermin unit he usually joins. You have seen them above in the Stormvermin and Poisoned Wind Globardier entries so I will not be re-posting pictures. Degrese is unmodified Island of Blood warlock, while Tyson is heavily converted (as described above). This is my Skaven army. I don’t really have any more ideas for adding new units. Other than putting together one or two more large Clanrat units accompanied by weapon team attachments I don’t really see a point. And that in itself would be a bit boring. What do you think? I will probably update this post at some point with pictures of painted and assembled models when I get them finished. As usual, questions and comments are appreciated. Do you play Warhammer? What armies? Do your armies have strong themes to them, or do you just pick whatever will win you games? This entry was posted in rpg and tabletop and tagged warhammer. Bookmark the permalink. Stormvermin would look awesome either jet black fur or even albino (with red/pink eyes). Got to say your brushwork is awesome. I used to have the empire vs lizardmen set, can’t say i loved playing as there was nobody around me who did….and i didn’t know how. I just loved customizing and putting together scenes i think….ever thought of fully customizing by going down the 3D printed route? Ah this makes me feel nostalgic! 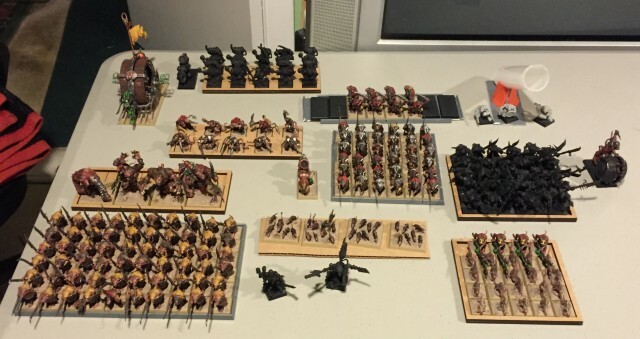 I played Warhammer back in 4th edition and had a small-ish Skaven army (and bigger armies of Undead and Orcs & Goblins). 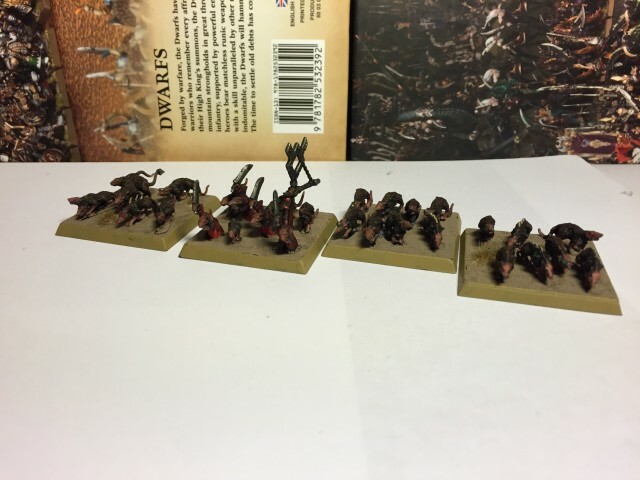 Back then they didn’t do plastic skavenslaves so using the proper models for them was ridiculously expensive (in terms of money-to-points ratio). As a result I just ended up with two medium-sized Skaven Warriors units, a medium-sized unit of Stormvermin, and lots of characters, war machines and specialist units. I did have a Screaming Bell though, which was cool (both in terms of the model and its gameplay effects). Does that still exist in Warhammer? Thanks. When I started I mostly learned from the British White Dwarf – back then it was still a hobbyist magazine rather than glorified sales catalog. I think people starting today have it much better – there is a plethora of amazing painting tutorials on Youtube that teach you not just the basics but also advanced techniques. Would have never stumbled onto that on my own. Hell, when I was starting it took me ages to figure out how to properly dry-brush, or how to use a palette to thin down paints. It’s good but it didn’t really fit with the overall theme – I wanted more science than magic. :) Plus it is probably best used for bigger games. But yeah, I remember those times. 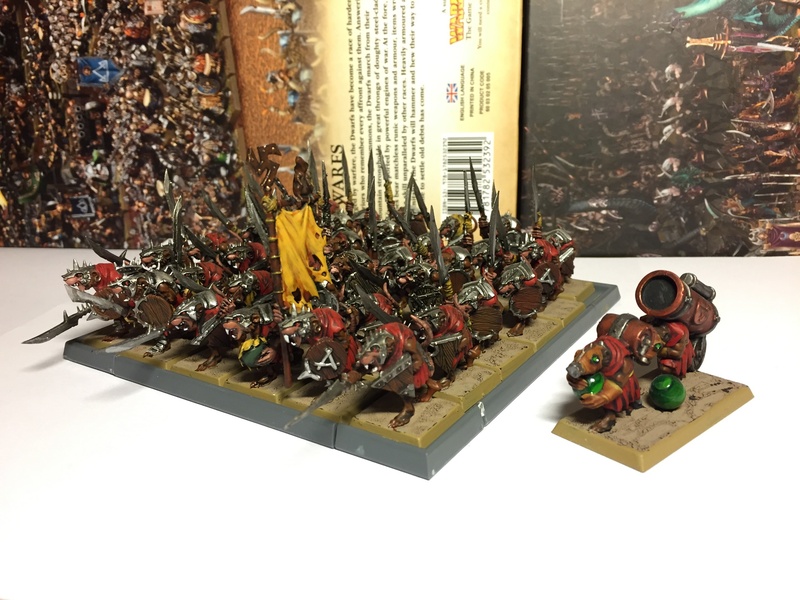 I have a Dwarf army from that era that is almost 100% solid metal. It is kind of a mess in terms of miss-matched bad paint jobs. You can sort of trace my evolution as a painted by looking at these models. I’m slowly stripping them down, and re-organizing them into something usable. Back then I was just randomly buying models that I liked or which were available and not all the units are complete.